Baked beans for Easter dinner. Is that weird? I mean it can’t be weirder than White Trash Salad can it?? I may have mentioned one or 40 million times about how Easter isn’t my favourite holiday. That’s based on my two main criteria for judging holidays – the traditional food and the decorating. Easter is filled with all the things I dislike. Pastel colours and ham. It’s the time of year when marshmallows mixed with canned fruit are proudly set on the table and declared a salad. You can see my Marshmallow Salad recipe here. We refer to it as White Trash Salad because it’s a salad made out of marshmallows and canned fruit. Pretty self explanatory. A few years ago I started bringing baked beans to Easter dinner. Because ham and baked beans make sense together. They create a bundle of salty, smoky goodness in your mouth. Also, I don’t eat ham, so having baked beans ensures I’d have more than marshmallows and scalloped potatoes in my stomach. Now don’t think that you have to save these baked beans for Easter dinner. You do not. They also go great with any meats you pull off of your summertime grill. And as a quick autumn or cool spring day lunch to fill yourself up, beans on toast is fantastic! Filling, nutritious and – O.K. I know you’re ALL thinking of the tooting. So go ahead and giggle about the toots so we can continue with this serious baked bean discussion. These are traditional baked beans done in the oven and yes they take a day or two. I’ve done these in the Instant Pot and they just aren’t as good. BUT you can make them in an Instant Pot much faster and in a pinch if you have to. I’ve included instructions for Instant Pot baked beans as well. Even though you’re not allowed to call them baked because they’re Instant Potted. Not baked. This is where some controversy will pop into the bean conversation. After soaking my beans I use the same bean water later in the recipe. There’s evidence that throwing away the soaking water and using new water later in the recipe will reduce the toots. But I like the added flavour using the bean water gives. I used a bag of White Pea Beans (Navy beans) because I didn’t grow enough dried beans to make a whole pot of baked beans. The ingredients are classic baked bean ingredients. Nothing super fancy and no heat. To me, baked beans shouldn’t be spicy. But if you like spicy baked beans you can add a couple of finely diced jalapeño peppers. 2 days seems like a long time but 95% of that time is dedicated to slow cooking. You aren’t actively doing anything other than smelling the scent of baked beans waft throughout the kitchen. You soak the beans, mix the ingredients together and then pop the beans in the oven for 8 hours or so. When they’re cooked, the beans come out and they’re ready to serve. Just like that. So it seems like a big ordeal, but it really isn’t. It just takes a long time. As an aside, I am absolutely STUNNED at the amount of Baked Bean recipes on the Internet that are made with … CANS of baked beans. What the??? As I mentioned, this recipe is made with a bag of dried beans. Not a can of them. Old fashioned baked beans go well with any grilled meat and especially salty pork products. The next morning heat the beans to boiling and simmer for around 30 minutes. If the skin of the bean peels back when you blow on it the beans are done. Drain the beans and SAVE the bean water. Mix all of the sauce ingredients together and mix in the cooked beans. Put everything in a bean pot. Add enough of the reserved bean water to the bean pot to cover the beans by 1/2". Add bacon or salt pork to top of beans, cover and bake at 250 F for 7 hours. Remove lid and continue to cook uncovered for 2 hours to help the beans develop a dark brown colour. Serve with grilled meats as a side dish or on toast for a lunch. Remove from oven and remove bacon or salt pork. If you like your beans with some meat chop it up and mix it into the beans. I prefer to remove the pork entirely and just use it for the flavour and smokiness it infuses in the beans while cooking. 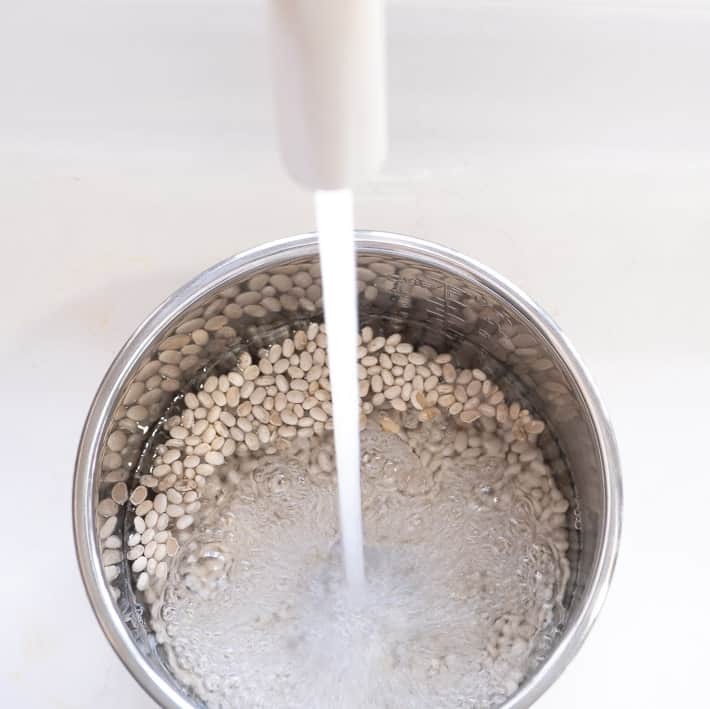 To eliminate the overnight soak, you can boil the beans for longer during their initial cook in water. Instead of simmering for 30 minutes, simmer for (apx) 90 minutes. If you're vegan or vegetarian and want to eliminate the bacon then double the amount of smoked paprika from 1/4 tsp to 1/2 tsp. TO COOK BAKED BEANS IN THE INSTANT POT (bleh) 1. Add your dried beans to the Instant Pot with enough water to cover them quite well. Cook on high for 25 minutes. They might be perfectly done or they might be overdone and mushy. It depends on the bean. And that's why I don't like the Instant Pot. 2. Drain the beans and return them to the Instant Pot. Add all of the other ingredients and cook on high for 10 minutes. 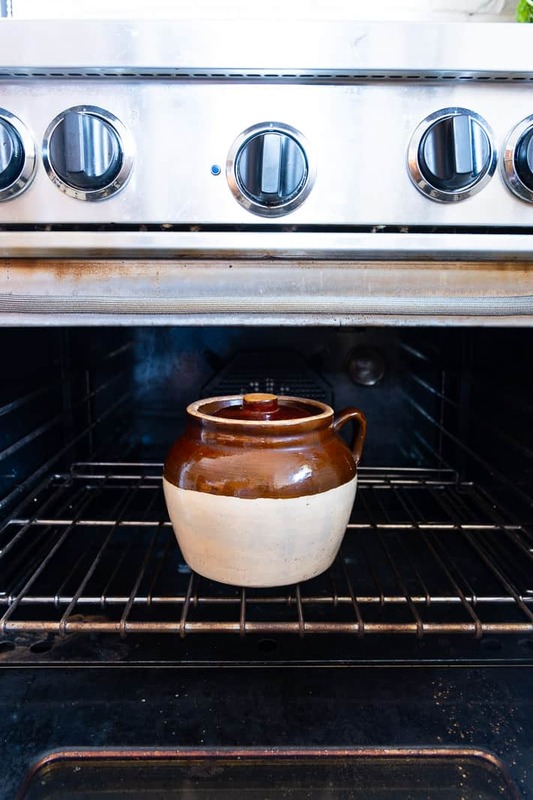 If you don’t have a bean baking pot, just use any oven safe casserole with a lid and keep your eyes open at antique shops and flea markets for a vintage baked bean pot. Just check the inside to make sure it’s still in good shape inside with the glaze in tact and no crazing. This is where you get to answer my question. Baked beans for Easter dinner. Is that weird? 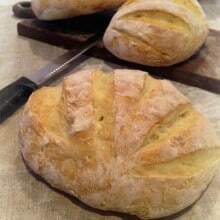 No Knead Bread. Cooking it in a wood fired oven. 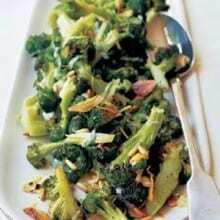 5 Ways to Serve Broccoli. If you don’t like broccoli, don’t worry it’s still a good post. Yeah, well at first I thought “yes, it’s weird to have baked beans on Easter!” But then, when you mentioned ham, I thought “well of course, it makes total sense”. So I just may pull out my Mom’s recipe that’s about 60 years old (and which is remarkably similar to yours) and make it! See? It *kind* of makes sense, lol. ~ karen! It makes complete sense! Our traditional New England Easter dinner is Ham, Baked Beans (absolutely NEVER from a can), asparagus, and Grandmother’s Potato Salad. My Aunt used to make the jello salad with carrots (no marshmallows) but no one has carried on the tradition since she passed. 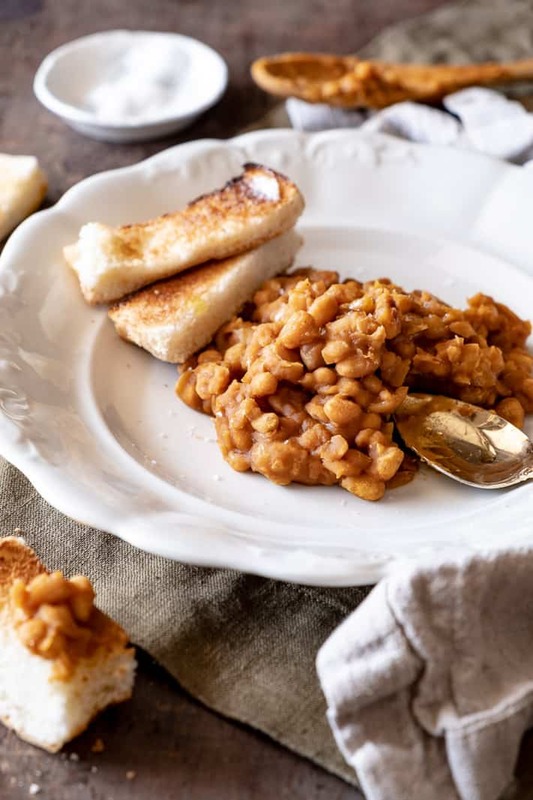 You have the quintessential New England Baked Bean recipe right here and I’m thrilled to see you use the traditional bean pot. It truly makes a difference. Happy Easter!! To me-never. To hubs and the kids-definitely weird. If it was up to me, I’d be happy with a crock of baked beans as the star of almost any holiday meal, toots and all. I love baked beans that much. We don’t eat much meat. My sons favourite food is beans. So it would be a gas! A hoot! Root n tooty fun! You get my drift. I really like adzuki beans and am forever trying to get them to taste how I had them from a Korean restaurant. I will give your recipe a try. Thanks. We always have lamb at Easter with scalloped potatoes and peas…sometimes a ham but not always…guess we are rebels! Marshmallow salad…I have heard of it but I don’t actually know anyone who makes it or …shudder…eats it. And pastels? I’m totally with you there. 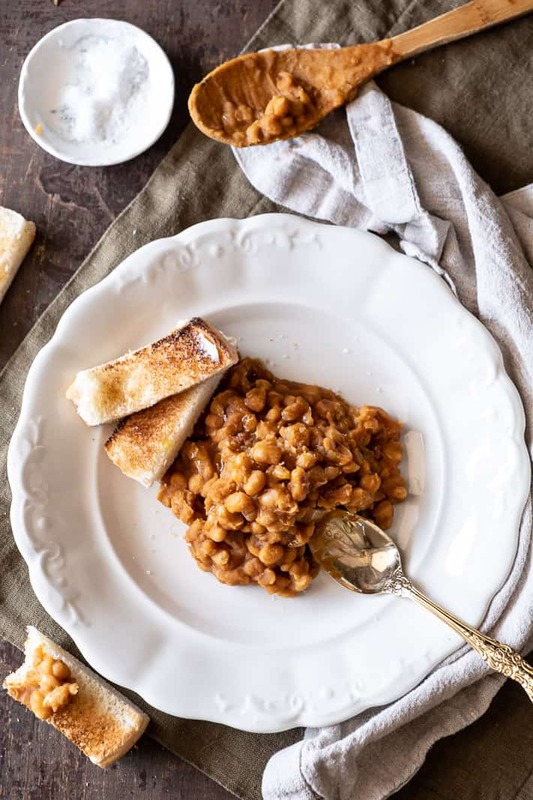 Baked beans ….nah, not weird ….. and way better than marshmallow salad. My DIL texted me tonight about Easter egg hunt and then early dinner (there are toddler appetites to take into consideration). She asked me to bring brioche rolls and scalloped potatoes. Now I’m thinking I need to do baked beans, too! I always get a pork shank to throw in the pot and then dice the meat off and include it with the beans. Now my mouth is watering! Yes, that’s how a lot of people do it. With a pork hock or something like that. But pork almost sickens me so I stick with bacon. Which everyone knows isn’t really pork, it’s magic meat. ~ karen! Love baked beans. I’ll try your recipe, done in the oven. Not so keen on ham, but will eat a little. Accompany the scalloped potatoes with devilled eggs and cornbread. Any other vegetable than marshmallow salad. I made Baked Beans with BBQ Ribs and scalloped potatoes for Christmas dinner. Everyone thought i was crazy for making what most of them considered summer grilling/picnic food for Christmas. It was delicious!. So Nope, I dont think it’s weird to have baked beans for Easter Dinner. Yeah, what is with those recipes that start out with cans of baked beans!?!? It’s the weirdest thing! And a TON of online recipes all start with a can of baked beans. ???? ~ karen! Baked beans at Easter weird – not at all. White Trash Salad (pastel marshmallows) – not at all. 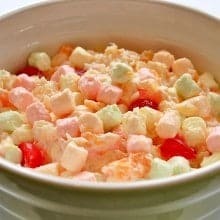 I have both of these dishes year-round; White Trash Salad with standard white marshmallows. Query, if you have a chance: How big is your bean crock? For instance, is there a number on the bottom? I ask because mine is too small to accommodate a full bag of beans after their expansion and all. Eep. I don’t know. I’d have to look. It’s a standard sized bean pot to me. Like what I see at antique markets all the time. I’ll try to check later today to see what the number is but it seems to me 1 bag would fit and I feel like I remember having done a whole bag in it. ~ karen! I have never made baked beans in the oven. I thought they *had* to be made in a slow cooker. Now I have to question everything I thought I knew! 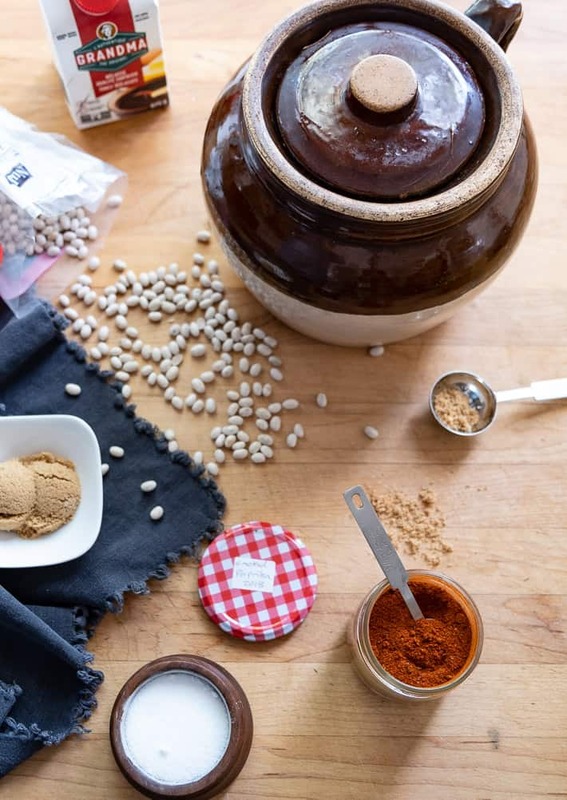 I am curious if you use black strap or sorghum molasses? I was born in Illinois (black strap)and grew up in Tennessee (sorghum). This is always an issue for me to decipher. Well, I use Fancy Molasses. It’s the highest grade of molasses in Canada. So I guess I don’t use either blackstrap or sorghum, lol. ~ karen! I have never seen the salad that you mention, unless it had Jell-o in it as well? Maybe I have seen that one- it was more of a Baby Boomer’s recipe than a white trash recipe, I think. I have to have brown bread with my baked beans- that is a New England thing where I come from. B&M brown bread is still available in a can. You can order it online if your neighborhood stores don’t carry it. Lots of recipes for from-scratch brown bread on the Internet – just google New England brown bread. Several flours, always including corn meal. And molasses. I would skip the raisins, but that’s your choice. It’s called brown bread because the molasses makes it dark. Thank you so much! I’m with you on skipping the raisins. Corn meal is a surprise and I guess my problem trying to find the recipe is I thought it was just dark wheat bread and forgot about the brown part. Searching for New England brown bread is the key. Karen’s commenters are the BEST. I have to say that a couple shots of bourbon give this recipe a most delectable flavor. Maybe it’s just me but I do enjoy it. Right there with you on the whole Easter – pastel – marshmallow thing, Karen. As a child, I was hauled off to sunrise Easter services by my Minnesota Lutheran parents and I don’t think I’ve ever been quite the same. Makes for quite a long day, and then there is all that pastel stuff to eat with the ham. Way to spoil a holiday, folks. “Way to spoil a holiday, folks” Agreed!! And the bourbon (or maybe Irish whiskey) is a great idea! ~ karen! There is nothing better than the smell of beans baking slowly in the oven. If ‘they’ omade a “baked beans aroma” air spray, I’m sure realtors would buy it by the case to see their sales multiply. I would have thought your Easter dinner would feature a ton of eggs. Of course, crispy fried eggs go very well with beans. Now I have to go and look on the interwebs for those canned-bean recipes. That’s totally bizarre! You are of Danish decent and don’t like ham? I’m worried about you. It’s true. I don’t like pate or herring all that much either. ~ karen! Full disclosure: I am a product of the Deep South (almost the southernmost part of Alabama) and we like our beans smoky/sweet. My mother used to swear that adding pineapple to the bean recipe would reduce the resulting flatulence! Not sure it worked, but . . . delicious smoky/sweet beans! Matters not when you have baked beans. We have a recipe similar to yours that is served at every holiday. It’s in honor of someone very special to us. Grandma Ruth. Yep, it does take a day to get them ready but oh so worth the wait. I’ve always loved giving the recipe along with an antique bean to a couple getting married. 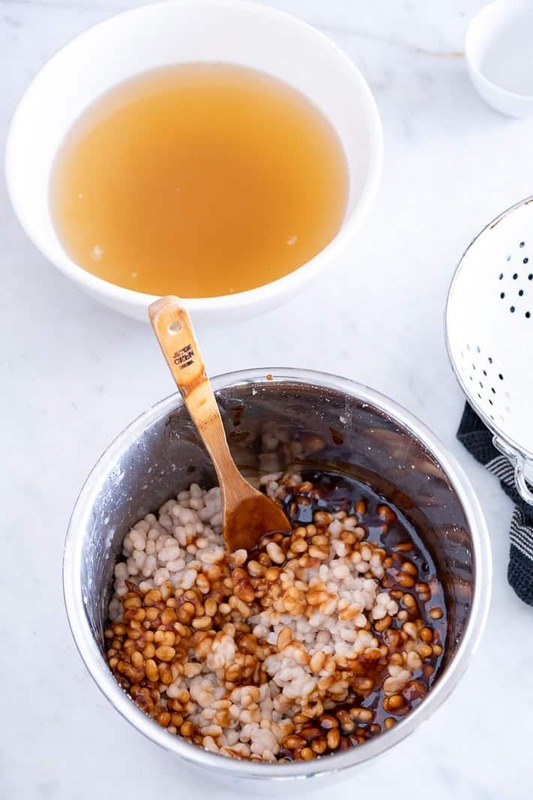 You should try sorghum instead of molasses next time. Karen ~ sounds delicious! I’ll come to your place for baked beans for Easter!!! My Mom is from down East ( New Brunswick). Easter is always ham, scalloped potatoes, cole slaw, baked beans and brown bread, Yum!! See? I’ve never been there but I’ve always felt like East Coasters are my people. 🙂 ~ karen! You have to tell us why you don’t like ham. It’s one of my 3 favorite foods. Unfortunately, cannot eat right now due to restricted salt diet, it’s KILLIN me. Do you boil the ham first? My mother-in-law made the best ham and she taught me the “right” way to cook it. The most important thing – never, never, ever, use one of those “nuggets” masquerading as ham. 2. Place in stock pot and cover with water. Bring to boil and then reduce to a very soft boil. Boil for one and a half hours. 3. Remove and place in oven-proof shallow pan and spread with glaze and bake in 300 oven until glaze is bubbly. Baste several times. Approx 30 min. Moisten with white vinegar until spreadable. My mother-in-law swore that boiling got rid of most of the salt and any other chemical nasties. It does produce the best tasting, tenderest ham. About ten years ago my grandmother introduced baked beans and potato salad as sides for Easter. It’s like a picnic! How would you cook this using an InstantPot? Looks delicious. Oops, sorry. I see you have Instant Pot cooking info. That is what I get for reading before having first cup of coffee. instead of molasses why not use maple syrup? Karen, an almost identical recipe has been in our family forever. The only difference is we specify Coleman’s Dry Mustard. It adds a bit of bite. 😉 It’s never Easter, a picnic or tailgate party without it! Any variation or improvement isn’t tolerated… simply not done…some things are sacred after all…. As Deb suggested I add pineapple to my baked beans. I do not have a recipe because I will often improvise when I am preparing food. Yes, people do seem to like the addition of pineapple – it creates a bit of sweet/sour with the other ingredients. I love baked beans and have the exact same bean pot. It was my moms. Somehow I was the lucky one that ended up with It. 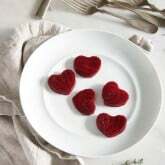 So I’m going to make these. It’s been awhile but I love them too!tha is for the nostalgia and the recipe Karen ! If I don’t eat meat what can I use to get the smoky bacon flavor? Suggestions? I have an old bean pot that I always look at and think “I should make baked beans in that!” but I never have. Now is the time. We are about to get dumped on with a late season snowstorm, and a house filled with smell of baking beans might be just thing. Hi Teresa! You can either cook the beans for the last portion on a smoker (which might be a bit much if you don’t have a smoker obviously) or you can double up on the smoked paprika. ~ karen! Or how about Liquid Smoke? I think I’ve used that in the past. I’m not a huge fan of liquid smoke, even though technically it really is liquid smoke. Not imitation. Maybe a teeny tiny teeny miniscule amount. ~ karen! My Mom always put so much brown sugar in that it was like a Bean Dessert. Yuk! Oh, and we always threw out the water from soaking the beans and put fresh water in for cooking. Beans and ham make total sense, but Easter dinner needs asparagus. Asparagus is the official vegetable of Spring. As much as I loathe marshmallows, I might have to make a small dish of this salad using chopped-up marshmallow peeps, just to screw with people. I might toss in some jelly beans, too. Could be fun. LOLOL! omg, the jelly beans, lol. ~ karen! What can I use if I don’t have a bean pot? 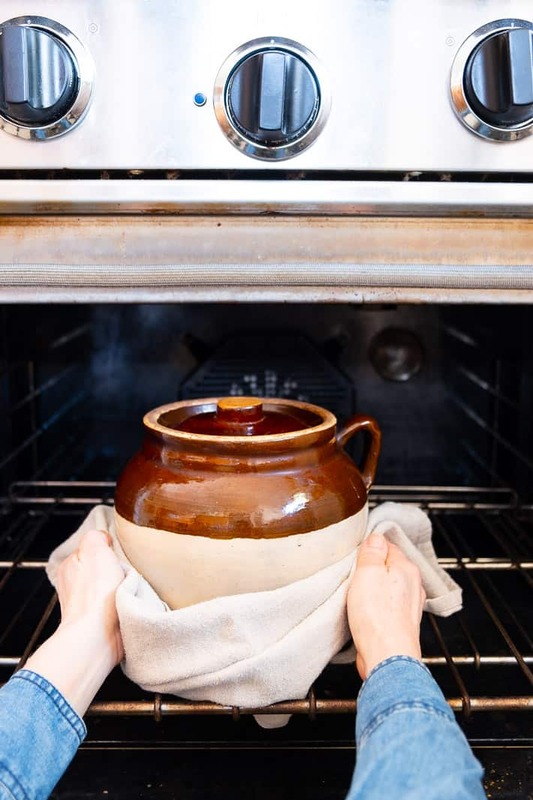 Just use a casserole with a lid, but if it’s short and narrow check on them often to make sure they aren’t drying out because of the larger surface area. If they are just add some water. ~ karen! …..HAM? Who eats ham on Easter?! But no matter what I’m having, I’d eat homemade baked beans with it. 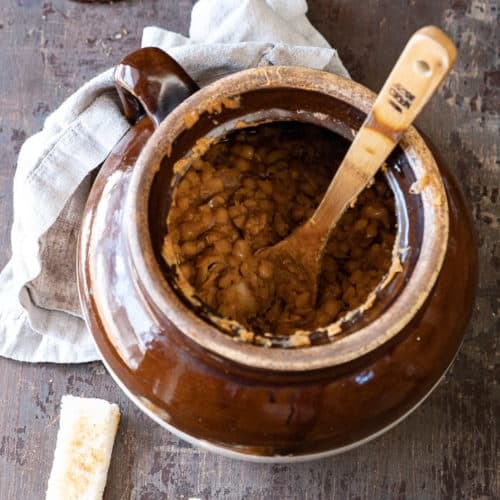 My granny made EXTRAORDINARILY amazing baked beans, in a lovely bean pot, usually with substantial amounts of molasses in them. I gotta grow more beans. Great recipe and very excited to try it. A favorite old friend left me a bean pot years ago and I’d never had instructions on how to use it, so this is quite perfect and thanks Karen! Got my seedlings going… got basil, four tomatoes and some fennel started… just waiting for the cold temps to KNOCK IT OFF. And of course, for your gardening posts! Those look awesome! Thanks for the idea and the recipe. Have you checked out Rancho Gordo website for dried heirloom beans? They are superb! I can’t remember … I think I did have a look. The only one I wouldn’t mind adding to my collection this year is the Orka bean or something similar. They look SO cool. ~ karen! Can’t wait to try this. This will be our Easter dinner along with a green salad and crusty bread. Thanks for making Easter easier….and much healthier. I did get a dehydrator for Christmas from my mother! I believe it’s the one I linked to. A 6 tray Excalibur and it works great. I’ve used it to dry mangos, make yogourt, dry apples and something else that I can’t remember at the moment. ~ karen! Someone else mentioned adding bourbon and I said the next time I make them I was going to add whiskey! I was going to add Irish whiskey but you’re right, rye whiskey would be more appropriate, eh? ~ karen! Do you use 1 tsp. prepared OR dry mustard? Will definitely make these as soon as I know. Hi Ann! It’s prepared mustard. ~ karen! Neither of my sisters nor I had her recipe. I was looking for something simple and delicious as we plan to spend most of that weekend playing outside, and I don’t have a big event planned. I have the pot too! I mainly use it for the dogs’ cookies, lol. Thanks for sharing this great Easter idea! I’ll have to try your bean recipe as I love baked beans! I love those squares (you can get them at Starbucks) called confetti squares with the peanut butter, butterscotch chips and multicoloured marshmallows; in our house they are called trailer park squares. I could eat the entire pan with a spoon (I’m classy like that) :). I grew up in New Brunswick and had relatives on PEI and I don’t remember baked beans at holiday dinners! Oh well, never too late to start a new tradition. I’m in Alberta now and plan to take this to an Easter potluck supper. Thanks for the recipe – I don’t have a bean pot so my dutch oven with lid will have to do. I do have an Instant Pot but I want to be able to say that it took me two days to make the beans! I’ll try to remember to report back after! Karen, no need to publish this, but it’s “intact” — one word — not “in tact”.